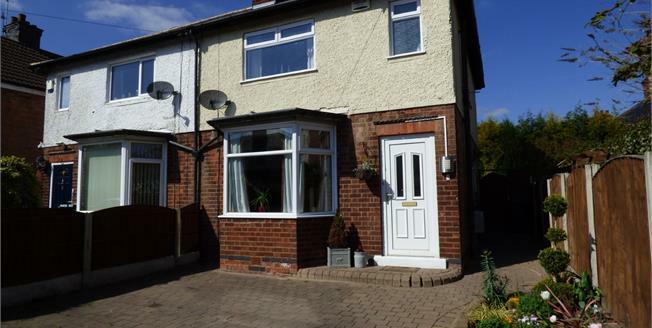 Well presented three bedroom semi-detached property with off road parking. The property offers well proportioned accommodation and is in a sought after location. In brief the accommodation comprises of entrance hall, lounge with bay window, breakfast kitchen, ground floor bathroom. To the first floor there are three bedrooms, master bedroom with a separate WC. To the front of the property is a driveway providing off road parking for two cars, with a well maintained enclosed garden to the rear. Double glazed bay window to the front, radiator, television point, gas fire with wooden surround, marble hearth, under stairs storage. Low level WC, panelled bath with shower over the bath, double glazed uPVC window facing the side, radiator. Rolled edge work surface, built-in wall and base units with breakfast bar, sink and drainer, electric oven, gas hob, overhead extractor, space for washing machine, integrated dishwasher, single glazed window and door to the rear, radiator. Single glazed door to the side and window to the rear. Double glazed uPVC window facing the side, loft access. Double glazed window to the front, radiator, feature fireplace. Double glazed uPVC window facing the front, ow level WC, wash hand basin. Block paved driveway to the front of the property providing off road parking for two cars, access to the side to the enclosed rear garden. The rear garden is well maintained with a lawned area, patio, flower beds with plants and shrubs and a garden shed.